When you arrive at the port please follow signs to check-in, where you can collect your boarding passes. Motorists should check in a minimum of one hour before departure. Passengers on foot should check in a minimum of 40 minutes before departure. Condor Ferries Portsmouth Terminal is easily accessible and offers a range of facilities. Our services operate between Portsmouth and Guernsey and Jersey. Take a look at the Portsmouth Destination Guide and Portsmouth Ferry Times. If you require assistance getting through the Port please advise the ferry company when booking or a member of staff when checking in. There are toilet facilities for people with disabilities throughout the Port. A special minibus service is available to help wheelchair users or those with reduced mobility and their companions board the ship. Assistance is also available for those travelling by car, enabling parking on the car decks close to the lifts. The Port car park has designated spaces for people with disabilities and/or reduced mobility and there are additional bays adjacent to the main terminal building. Please request these at the time of booking. An accessible toilet with ceiling tracking hoist, height adjustable adult-sized changing bench and peninsular toilet is located on the ground floor of the terminal building. It is accessible by radar key. From London, take the M3 or A3. From the Midlands take the M3 to the A34, and from the South West take the A31. From Bristol and South Wales take the A36. These roads lead to the M275, from which an exit road leads directly to the port. If using a Satellite Navigation System to get to Portsmouth Ferry Terminal please use the postcode PO2 8SP. The nearest bus stop is located about a 10 minute walk away. There is a National Express coach point outside the Portsmouth Ferry Terminal. Whether you are looking to travel regional or national there are several services to meet your needs. Before you travel, we will have emailed you an e-boarding pass. Please print this off and bring it with you on the day. Or, if you plan to show it on a mobile phone or tablet, please have this ready for our port team when you arrive at the terminal, with the brightness turned up. 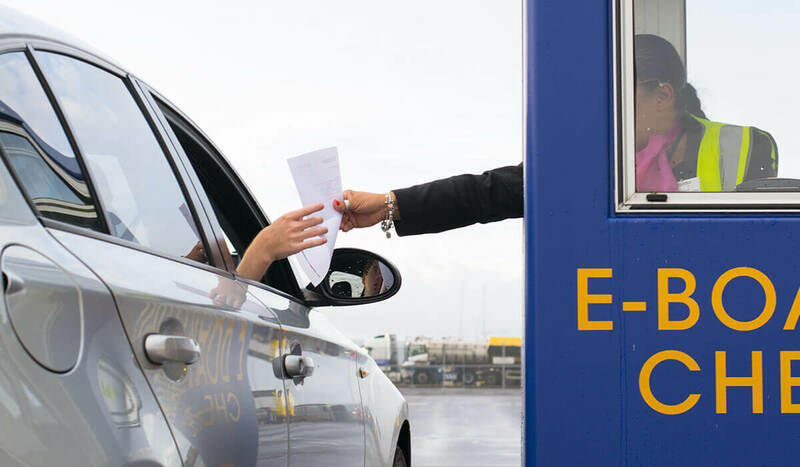 Please print off the e-boarding pass we will have sent you, and bring it with you on the day, placing the itinerary page (pink copy) on your dashboard. If you’re using a mobile phone or tablet to show your boarding pass, please have this ready for our Port staff when you arrive at check-in, with the brightness turned up.